What do you think of when people talk about beautiful homes? Is it a pleasant living room with a wide bay window? A stately dining room or an adorable nook? What about a serene bedroom? Whatever it is, you probably don’t picture the kitchen. 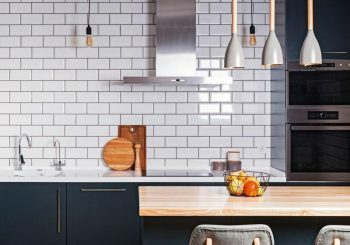 If you’re someone who doesn’t think of kitchens as having style potential, prepare to be surprised. Star Builders can tell you all about ways to use a kitchen remodel in Salem to spice up the look of your living space. The idea of updating any room in your home might seem daunting. A kitchen remodel in Salem doesn’t have to be a big operation. You can take on parts of the work piecemeal, or at whatever scale you choose. Wallpaper: A simple foot-high section of wallpaper running over the counter. You’ve seen this in your grandmother’s house, usually something with flowers or garden veggies. This is easy to set up, as you don’t have to have any special skills. Just paste up the paper wherever you want it. The problem is that the area behind the sink often gets wet, and the area behind the oven gets spattered with grease. This can easily stain or cause your wallpaper to peel. Tile: Tile is a solid choice for backsplash materials. It’s strong and durable, as well as easy to clean. Tile also comes in your choice of many colors. The problem is that it can be difficult to repair if you chip it, and tile is fairly costly. Marble: For someone who really wants to make a striking impression. Marble is a beautiful stone that has a unique two-tone coloration. It’s very expensive and very heavy. You also need to use special stone cleaners because rock is a porous material. Metal: You can get metallic borders. They provide outstanding protection against water and are exceptionally durable. You can get flat metal or pieces that are stamped with repeating designs. They’re also more expensive than wallpaper. Replacing your cabinet doors is a simple project. You can get it done yourself over the weekend. For something so simple and easy, it creates a more dramatic effect in your home. Gather Your Tools: This job requires a power drill or driver, standard Philips bits, and wood fasteners. You might also need wood filler putty. Remove the Existing Doors: You can remove the doors by using your power driver. Most fasteners in this type of carpentry have Philips’ heads. Inspect the Holes: You need to make sure that the screws haven’t stripped out the wood. If the holes are too big, you’re not going to get your screws to find purchase. Fill the Holes if Necessary: If any of the holes are too big, use the wood filler putty to fill them in. Make sure that you use a non-shrinking cellulose variety. The label should call it “safe for sanding and screwing”. After it dries, sand it smooth if necessary. Screw in the New Doors: Align the door hinges over the holes. If you had to fill any in, use a pencil to mark their position. Now screw them in with your driver. Be sure to use wood screws, as they have broader threads. Test the Set: Gently open and close the door, making sure that it’s sturdy. Also, measure the angle. If you don’t have it perpendicular to the floor, depending on your setup, you might not be able to close both cabinet doors. And Repeat: That’s all there is to it. Now do this for every other cabinet door in the kitchen. Wood: Wood grain has a beautiful look. It adds an organic appearance to your room’s decor. Real wood is sturdy enough to hold up to repeated use. MDF Panel: MDF, or medium density fiberboard, is made from layers of wood products. It’s somewhat strong but doesn’t look nearly as beautiful as the real thing. Glass: Glass or acrylic windows built into the door make your kitchen look more sophisticated. It’s best not to use glass windows on floor-level cabinet doors for safety’s sake. Once you’ve done these projects for yourself, you might find that you still want to do more. To save yourself some time and to ensure that you get the best possible results. Hire a professional. Here at Star Builders, we’ve been working on kitchens since 2007, and in that time we’ve built up a reputation for quality, integrity, and dependability. We can work with types of kitchen projects, from small to complete overhauls. If you’re not sure what you want, but you know that you need a change, we have designers on our team. All you need to do is give us a call or fill out the contact form on this site. We set up a free consultation to learn what it is that you want and to come up with a plan to make your vision come true. Once we have the plan in place we explain the job and its terms to you in plain language. There are no surprises; what you pay for is exactly what you get. If you ever plan to go beyond your kitchen, we do all sorts of remodeling. Come to Star Builders for your first project and you’ll keep coming back again and again.